Objective: To set a double switch to create space and let the way free for player 5 to shot. 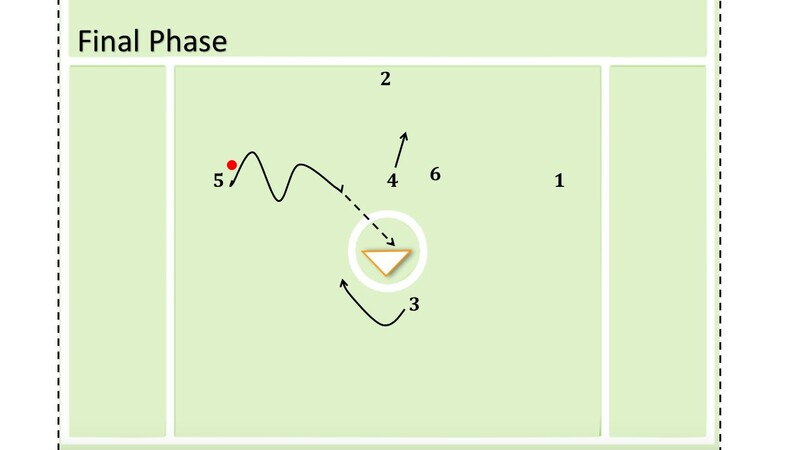 - This is a quick ten-second play that Works well off the end line. - Players 3, 4 and 6 represent the attack. - Players 1, 3 and 5 represent the midfielders. - Player 5 begins the play with the ball. - Players 3 and 6 switch their positions. - Players 1 and 2 switch their positions. - Player 5 holds the ball on the side. - Player 3 back up to “X”. - Player 4 clears out the crease.